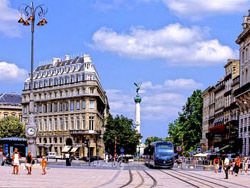 At the crossroads of the Atlantic Ocean and the Garonne River, Bordeaux is a charming port city situated in the south west of France. Capital of the Aquitaine region, “La Perle d’Aquitaine” (The Pearl of Aquitaine) is the ninth largest city of France with a population of 240,000 inhabitants. The founding of Bordeaux dates back to the fifth century B.C, when some vineyards already started to spring up! Burdigala, as it used to be called, experienced a significant development thanks to its port, whilst some of the the ancient city constructions and remains are still visible today. Don’t be surprised if Bordeaux seems to have a certain “English flair” – the city was actually ruled by the English for a long time! 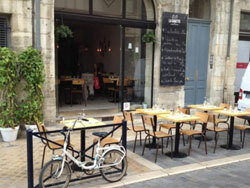 You’ll never be bored in Bordeaux! One of my friends had spent a year in Bordeaux and she had told me what a lovely city it was so I expected to enjoy my time there – but I was surprised just how much I loved it! Lovely architecture, historic buildings, restaurant after restaurant and lively nightlife – what’s not to love! During my trip I stayed in a studio apartment in one of the school’s ApartHotels and was pleased with the standard of the room and the facilities. I was a bit nervous about being able to find the school in Bordeaux as I have such a bad sense of direction, so I decided to take the bus the first day. However, I soon realised how easy it was to reach the school whether I walked or took the bus. The staff at the school were so friendly and helpful too. 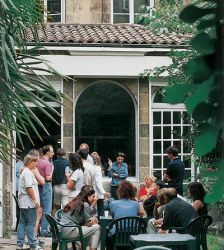 There’s also a comfortable student lounge where you can chill out on the sofa on your break and when the sun is shining you can make the most of the school’s garden.